The court granted defendant's motion to strike the report of plaintiff's damages expert for improperly relying on the entire market value rule and denied plaintiff the opportunity to submit an amended report. "Over the course of many years and more than a dozen patent trials, the undersigned judge has concluded that giving a second bite simply encourages overreaching on the first bite (by both sides). . . . [T]he trial date is only four days away and the parties and the Court have built their calendars around that date. To start over with a new royalty analysis would impose prejudice on the defense as well and disrupt the Court’s calendar, which is burdened with other trials set far into the future. Possibly, plaintiff can cobble together a royalty case based on other disclosed witnesses and evidence. Possibly not. If not, it is a problem clearly of plaintiff’s own overreaching and it will not be allowed a second bite at the apple." The court granted defendant's motion to compel further infringement contentions because plaintiff failed to show that claim charts for 7 accused products were representative of all 101 accused products. "[Defendant] argues that [plaintiff's] representative claim charts are insufficient because they identify the allegedly infringing features of only 7 of the 101 products accused of infringement, and fail to explain why these 7 products are representative. . . . [Plaintiff] has failed to show how the seven claim charts are representative of the Accused Instrumentalities as a whole. In its infringement contentions, it merely states its belief that these products are infringing, without providing any support for its belief. . . . While the Court is sensitive to [plaintiff's] concerns about the expense of reverse engineering over 100 products, it must provide more evidence to show that these products are representative." The court denied defendants' motion to compel plaintiff to produce a 30(b)(6) witness for deposition regarding profitability and license agreements. "Defendants contend that profitability is relevant to commercial success, which is a secondary indication of obviousness. . . . While the Court agrees that profitability is at least marginally relevant to the commercial success analysis in the present case, discovery of such information through Rule 30(b)(6) deposition testimony would be unduly burdensome at this stage of the case. Defendants allowed more than a year to elapse prior to filing the present application. Moreover, Defendants did not seek such information in written discovery, further compounding the burden on [plaintiff]." The court granted defendant's motion for summary judgment of noninfringement as to plaintiff's on-line services patents where plaintiff dropped the asserted claims of that patent. "[Plaintiff] earlier dropped the asserted claims of the [previously asserted patent] and now provides no theories of infringement related to [that patent]. Thus, [plaintiff] cannot meet its evidentiary burden. [Plaintiff] argues that the Court cannot grant summary judgment over unasserted claims because the Court does not have jurisdiction over claims that have been voluntarily withdrawn. The parties have failed to come to an agreement regarding a stipulation of dismissal of the [patent-in-suit's] claims, so the Court believes it still has jurisdiction over claims relating to this patent. As there is no evidence to support a finding of infringement of the [patent], the Court will grant summary judgment of non-infringement." The court granted in part plaintiff's motion for a preliminary injunction to prevent defense counsel from enforcing a cease and desist order issued by the Nebraska Attorney General prohibiting plaintiff's counsel "from initiating new patent infringement enforcement efforts within the State of Nebraska." "During the hearing, the Court questioned counsel for the Nebraska Attorney General. Counsel conceded that this court has complete and exclusive jurisdiction over patent cases. He further conceded that the cease and desist order is not intended to keep [plaintiff's counsel] from representing [plaintiff] in this case or a case in any other jurisdiction. He also agreed that [plaintiff's counsel] can pursue any of the prospective infringers that have already been identified and can file suit against any newly identified potential infringers. Counsel for the Nebraska Attorney General stated that the cease and desist order only prohibits [plaintiff's counsel] from sending out letters to potential new infringers. With these concessions, the Court will rule that [plaintiff's counsel] can file an appearance in this case or any other federal cases without running the risk of violating the State of Nebraska Attorney General’s cease and desist order. Further, [plaintiff's counsel] may proceed to prosecute their cases, including all discovery, as it would in any other lawsuit." The court stated that a later order would address "whether this court has jurisdiction to determine the constitutionality of the cease and desist order." The court denied plaintiff's motion for summary judgment that its nerve stimulation patents were not invalid due to public use under 35 U.S.C. § 102(b) based on surgical procedures. "[Defendant] admits that 'medical procedures' are 'inherently non-public.' As a matter of common sense, an operating room is not in the 'public domain' and freely accessible, unlike the hospital itself. But the fact that an actor practices a method alleged to be an invalidating prior use within the confines of an operating room does not necessarily mean the method was not 'accessible to the public.'. . . [A]lthough there is no evidence that non-hospital staff or patients knew of or observed the rapid pacing, [defendant] may be able to show by clear and convincing evidence that the procedures were publicly accessible and not limited by an obligation of confidentiality to the cardiologists. [Plaintiff] does not prove that these individuals were under any obligation of confidentiality, whether implied, express, or ethically imposed." The court denied defendant's motion for summary judgment that plaintiff was judicially estopped from asserting infringement based on statements about the patent-in-suit during prosecution of another patent. "[Plaintiff] conceded that a presterilized, disposable sampling device would be patentable notwithstanding the [patent-in-suit], but not that such a device necessarily would avoid infringement of the [patent]. The Federal Circuit has recognized - odd or rare as the circumstance may be - that a device may be patentable over prior art without avoiding infringement as a matter of law. [Plaintiff] thus has not taken mutually exclusive positions and is not estopped from arguing that the [accused] device infringes the [patent]." The court granted plaintiff's motion to dismiss defendant's unenforceability counterclaim based on alleged violations of protective orders in two previous actions between the parties. "It is not clear from [defendant's] pleadings whether it seeks relief under the doctrine of inequitable conduct for actions perpetrated by [plaintiff] against the PTO or for fraud perpetrated by [plaintiff] against [defendant]. Either way, the gravamen of [defendant's] allegations remains the same: that [plaintiff's counsel] performed strategic prosecution activities after receiving [defendant's] highly confidential information, in direct violation of the protective orders in the First and Second Actions. . . . [T]o render [plaintiff's] patents unenforceable, [defendant] . . . must identify the specific who, what, when, where, and how of the alleged violations of the protective order. . . . [Defendant's] pleadings do not include sufficient facts to establish how [plaintiff's counsel] allegedly violated the protective orders or the details of his violations. . . . By alleging that [he] conducted patent prosecution for [plaintiff] and that he subsequently gained access to [defendant's] confidential discovery materials as litigation counsel, [defendant's] pleading lays out some of the necessary preconditions for a violation of the protective orders. But without additional, specific facts demonstrating that such a violation did occur, [defendant's] pleadings do not satisfy the particularity requirements of Rule 9(b)." In Determining Venue and Personal Jurisdiction, Defendant “Cannot Target the U.S. Wireless Market Without Targeting the Eastern District of Texas." The court denied a Taiwanese defendant's motion to dismiss plaintiff's infringement action for improper venue. "The question of personal jurisdiction in the context of venue is limited to the judicial district where the suit was brought. Therefore, a plaintiff must demonstrate that the defendant has sufficient minimum contacts with the district where the suit was brought to show venue was proper. . . . [Plaintiff] has demonstrated that [defendant] placed its products into the stream of commerce with knowledge and intent that they would be sold in the Eastern District of Texas. [Defendant] describes itself as 'one of the world’s leading IC providers.'. . . Within the United States, Texas is the second most populous state. The Eastern District of Texas includes two of the ten most populated counties in Texas and several counties within the Eastern District form portions of two of the ten largest metropolitan areas in the United States. Thus, [defendant] cannot target the U.S. wireless market without targeting the Eastern District of Texas." Commonwealth Scientific and Industrial Research Organisation v. MediaTek Inc. et. al., 6-12-cv-00578 (TXED September 12, 2013, Order) (Davis, J.). The court granted defendants' motion for remittitur and gave plaintiff the option of reducing the damages award from $491,046 to $21,625 or proceeding with a new damages trial. Plaintiff's lost profits evidence was based solely on the entire market value rule which was unsupported by the evidence, and the reasonable royalty evidence supported only the lower amount. "[Plaintiff] did not present adequate evidence at trial showing that any customer decided to purchase a longwall power distribution system in the first place for the purpose of obtaining the patented draw-out tray technology. At most, [plaintiff's] evidence showed that some customers already in the market for longwall power distribution systems chose to purchase systems containing draw-out trays over systems not containing draw-out trays. [Plaintiff's damages expert], testified that he was unaware of any customer that already owned a working longwall power system without a draw-out tray and chose to replace it with a new system containing a draw-out tray in order to obtain the patented technology. Instead, [the expert] confirmed that customers first chose to buy a longwall power distribution system, and then chose whether the system would include the patented device. This kind of evidence is insufficient to invoke the entire market value rule. . . . [The expert's] only calculation regarding lost profits was based on the entire market value rule. . . . Because [plaintiff's damages expert] failed to provide any calculation of lost profits based on sales of the infringing . . . devices alone, the maximum award supported by the evidence was a reasonable royalty based on [his] proposed royalty rate of 4.325%. Applying that royalty rate to the defendants’ sales of 25 . . . devices at $20,000 per device, the highest reasonable royalty award supported by the evidence is $21,625." Electro-Mechanical Corporation v. Power Distribution Products, Inc., et. al., 1-11-cv-00071 (VAWD September 10, 2013, Order) (Jones, J.). The court granted defendant's motion for summary judgment that plaintiff's baking rack patent was invalid because a price quote from a prospective manufacturer to plaintiff’s predecessor prior to the critical date triggered the on-sale bar. "[The quote] was based upon specific renderings of a proposed product and provided exact pricing. It included a location of manufacturing, a timeline therefor, a reject rate, and a carve-out allowing the manufacturer to alter the pricing if the production information supplied by [plaintiff's predecessor] were to change. Again, while additional details needed to be worked out, such a specific pricing estimate manifests that the manufacturer was willing to enter into a bargain on the offered terms. . . . Moreover, the fact that such an offer comes from a supplier, rather than the entity that later secures the patent, is irrelevant. . . . [T]he manufacturer offered to produce a specific number of trays for [plaintiff] (which it already had design specifications for), and provided a price for doing so on a specific production schedule. . . . [T]here was no impediment that could have prevented [the predecessor] from accepting the terms of the manufacturer’s offer." Orbis Corporation v. Rehrig Pacific Company, 2-12-cv-01073 (WIED September 10, 2013, Order) (Stadtmueller, J.). Following a bench trial, the court found that plaintiff's drug manufacturing process patent was unenforceable for inequitable conduct and determined that plaintiff's conduct was so egregious a finding of materiality was unnecessary. "[T]his case is one of those exceptional cases where . . . a finding of materiality is not necessary. . . . Despite having test results that contradicted his statements, [plaintiff's founder/inventor] made affirmative misrepresentations to the PTO with respect to the nature of the prior art and the [accused] tablet that had been sold in the United States for years before [he] purportedly invented his process. In fact, as [plaintiff's] own expert testified, [the inventor's] process merely requires the addition of more water to [another] Patent's process. But [he] declined to share this information with the Examiner. Nor did [he] disclose that he had filed a second patent application regarding the stability of moexipril. He also kept from the PTO the '560 PCT, which was cited in the second moexipril application and was the basis for the Examiner's rejection of the second application. . . . [T]he misconduct in this case extended beyond misrepresentations to the patent Examiner and constitutes an abuse of the patent system itself. The practice of targeting a competitor's existing and widely available product and seeking to obtain a patent for the purpose of suing that competitor through a pattern of lies and deception should not be rewarded." Apotex, Inc., et. al. v. UCB, Inc., et. al., 0-12-cv-60706 (FLSD September 6, 2013, Order) (Middlebrooks, J.). HTC Corporation et al v. Technology Properties Limited et al, 5-08-cv-00882 (CAND September 6, 2013, Order) (Grewal, M.J.). The court denied defendant's motion for a new trial and rejected its argument that plaintiff's counsel engaged in improper conduct that confused the jury in a trial that bifurcated liability from damages. "[Defendant] avers that [plaintiff's] counsel improperly referred to alleged damages 'throughout trial.' . . . [Defendant] submits that [plaintiff]'s closing argument . . . violated the court's bifurcation of liability and damages and invited jury confusion.. . . The court does not find that [plaintiff's] alleged misstatements were directed at the issue of damages. Rather, they were used to explain what [plaintiff] does as a non-practicing entity. 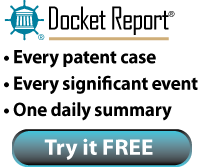 [Plaintiff's] desire to note that patents can be used to recover investment costs was understandable in light of [defendant's] statements to the jury that it has thousands of patents and that '[defendant] and other good companies . . . develop information, develop technology, get together and exchange it in [patent] pools. . . .' The court does not find that [plaintiff's] closing argument resulted in a miscarriage of justice that would warrant a new trial." MobileMedia Ideas LLC v. Apple Inc., 1-10-cv-00258 (DED September 5, 2013, Order) (Robinson, J.). The court granted defendants' motions to stay pending inter partes review where the court had denied a stay pending reexamination the year before and had found that the stage of the case weighed against a stay. "In the Court's [decision last year] denying a stay, the Court noted that the early stage of litigation and lengthy process of reexamination weighed against a stay. The inputs and result of this comparison are different now: while the case has substantially progressed, the inter partes review promises to be a more expeditious process than reexamination and appears to be relatively close to completion. . . . [B]y the time case-dispositive motions are filed, the inter partes review is likely to be over. . . . [T]he Court believes, under the circumstances, it is appropriate to allow the inter partes review a reasonable period to conclude before launching the parties into the expense of expert discovery." SoftView LLC v. Apple Inc., et. al., 1-10-cv-00389 (DED September 4, 2013, Order) (Stark, J.). The court awarded plaintiff attorneys' fees under 35 U.S.C. § 285 and found plaintiff's apportionment of fees based on the number of patents asserted at trial compared with the number of patents asserted during phases of the case to be reasonable. "The case was divided into three temporal phases based on the maximum number of patents at issue during each phase. The first phase was from filing . . . when as many as 11 patents were asserted. Because [plaintiff] ultimately prevailed on only the two patents asserted at trial, it limited its fee request to 2/11ths (18.2%) of the fees incurred during this phase. The second phase was . . . when no more than 7 patents were at issue. Thus it sought only 2/7ths (28.6%) of the fees incurred during this second phase. Finally, the last phase ran from . . . when [plaintiff] had limited the case to the two patents asserted at trial. For this last phase, PACT requested 2/2ds (100%) of the fees incurred. . . . The discount of the requested fees based on the number of patents asserted at any given time likely underestimates the time spent on the patents that were ultimately presented to the jury, since it is very likely that throughout each phase of the case more time was spent on the strongest claims. . . . Accordingly, the Court will accept the hours sought by [plaintiff]." Pact XPP Technologies, AG v. Xilinx, Inc., et. al., 2-07-cv-00563 (TXED September 3, 2013, Order) (Payne, M.J.). Following a jury verdict of willful infringement, the court granted plaintiff's motion for enhanced damages. Defendant's knowledge of plaintiff's patents and motivation to infringe weighed strongly in favor of enhancement. "Despite having knowledge of [plaintiff's] patent protection, [defendant] has failed to present any evidence that it investigated the scope of [plaintiff's] asserted patents and formed a good-faith belief that the patents are invalid or not infringed. [Defendant's] clearly expressed interest in acquiring [plaintiff's] patents suggests, at a minimum, that [defendant] did not have substantial concerns that the asserted patents are invalid. . . . At around the same time that [plaintiff] and [defendant] began having discussions, [defendant] became concerned that its main competitor . . . was building up a patent portfolio in the area of coarse-grained array technology, such as [plaintiff's]. [The competitor] was building its portfolio by purchasing failed companies that had desirable patent portfolios. [Defendant] became concerned that it may miss out on the 'patent grab' in a developing area that could be the 'future of computation.' [Defendant] identified small, innovative companies with patents related to this area of technology. [Defendant] surmised that these companies would likely fail for commercial reasons unrelated to their merits of their technology, and that their failure may present an opportunity to acquire valuable patent rights. [Plaintiff] was one of the companies identified as a potential target, and [defendant] noted that it appeared that [plaintiff] had a strong portfolio. . . . [T]he evidence suggests that the real reason for [defendant's] decision to not license [plaintiff's] designs was that [defendant] already had its own superior implementation of [plaintiff's] patented technology, and was not worried that [plaintiff], a much smaller company, would pose much of a risk to [defendant]. . . . [Defendant] hoped that by not engaging with [plaintiff], that it would hasten [plaintiff's] descent into bankruptcy. . . . The foregoing evidence weighs strongly in favor of enhanced damages." Pact XPP Technologies, AG v. Xilinx, Inc., et. al., 2-07-cv-00563 (TXED August 30, 2013, Order) (Payne, M.J.). The court granted defendant's motion to stay pending ex parte reexamination and rejected plaintiff's claim of undue prejudice based on defendant's choice of ex parte reexamination instead of the new inter partes procedure. "According to Plaintiff, the Defendants' motion to stay is 'a tactical move to push [it] to settle this dispute.' Plaintiff, however, has failed to show that Defendants requested ex parte reexamination or filed the instant motion for the purpose of delaying this action. . . . Defendants are legally entitled to invoke the reexamination process. The fact that Defendants have done so does not in and of itself suggest a dilatory motive. . . . Moreover, there is no evidence before the Court demonstrating that the new inter partes review process is actually 'quicker' than the ex parte reexamination process. . . . While the new inter partes review process is normally required to be completed not later than a year after the PTO notices the institution of a review, see id., the statutory scheme contemplates that the review process (filing date to certificate issue date) may take up to 24 months to complete before any appeal is filed." Internet Patents Corporation v. eBags, Inc. et al, 4-12-cv-03385 (CAND August 28, 2013, Order) (Armstrong, J. ).